With BST kicking in only hours before it was typical summer weather at Fowlers Wells on Sunday…cold and windy. It was the final Cup group fixtures for the U16s with the As facing Chipstead and the Bs hosting Farnham. Farnham were a very well-known opposition but for Chipstead there was just a single U12s game to look back on, in fact the first 15-a-side full pitch for Chob’ which ended in a 25-0 victory. Chipstead had some big units, and tried to use them early from a number 8 pick but the home defence was ready. From the next phase a loose Chipstead pass was scooped by Chris who was able to go half the pitch unchallenged and open the scoring. Within minutes it was 14-0 as Chobham’s tight play ensured steady possession for the backs. It was Chris again who went over following a deft chip from Aran at fly-half. Chobham almost capitalised on another loose pass as Harry was away clear down the wing before being cruelly brought down by a shot from the grassy knoll, or the portacabin anyway, giving the defence time to recover. It wasn’t long before the lead was extended however as Rhys broke left from a missed clearance and Adam was on the end of the move to score on the left. Chipstead kept trying to get into the game with a couple of big carries in midfield, and the scrum half being very busy. Chobham were in the mood by now though and the backs were running great supporting lines. It was Fin next to cross finishing off just such a move. 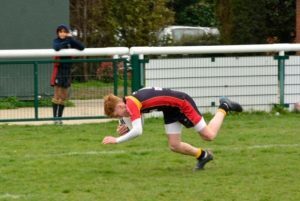 Chipstead were struggling now and when Matt caught the restart and put Olly on the attack the fifth try came immediately, Chris finishing off a first half hat trick. It was now that Chipstead had their best spell of the game. Chob were pinned back near their line after conceding a penalty. The visitors looked to work from lineout and scrum but the defensive line was up to the task even if it took a couple of tacklers to drive back on occasion, the pressure finally relieved when Chips were isolated at a ruck. The forwards had been watching the backs have all the glory to now, but before half-time they decided it was their turn. Chob had a lineout deep in the 25 and Al’s throw was on the money, as it was all game, hitting Doug as second jumper. Dan peeled from the front and as he hit the pod the blue and yellow line had a gap big enough to plough through and extend the lead. There was still time in the first half to go again and Fin crossed wide out for his second. The second half continued in much the same vein as Chipstead struggled manfully against a team that had really hit their straps this week. The handling between forwards and backs was as good as at any point this season which in turn led to several more scores as Adam, Rhys with a brace, Gideon and finally Aran kept the scoreboard ticking. The result means that Chobham look to be in the Harlequins Cup final in a couple of weeks with hopefully the form carrying through the next fortnight. The squads swapped places and it was Farnham who stepped out to face the boys from Chobham. The opening minutes made it clear this would be a much closer affair as neither side managed to get the upper hand and the penalty count was high on both sides. The opening score came from a series of penalties at the breakdown against Chob. The visitors’ lineout in the Chob half was solid and gave the opportunity to drive into midfield. The home defence was scrambling and conceded another penalty close in. Farnham took full opportunity and scored under the posts to take a 7-0 lead. The lead was short-lived however as Teo did what a good 7 should and popped up to intercept a pass from the scrum half to reply with Samuel levelling up at 7-7. It was Farnham who struck back just before the break, opting for a penalty kick just inside the 25 to make the score 7-10 on the whistle. The second period opened with Chobham keeping Farnham out along the home 25. Chob pinched a scrum against the head and the ball quickly reached MattW on the right wing. Using all of his pace Matt carried into Farnham territory before being brought down. 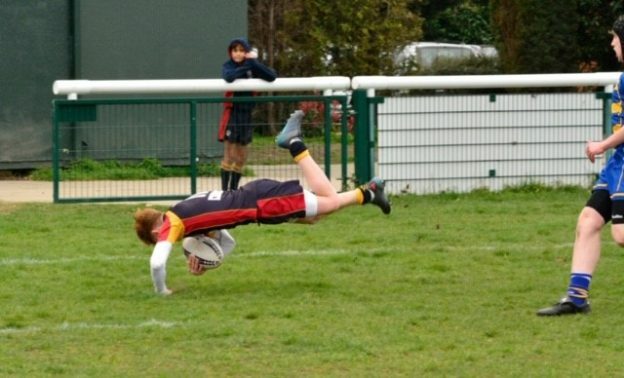 Cruelly the ball popped sideways out of the ruck and the Farnham scrum half was first to react. Spotting a narrow blindside channel he set off and had enough pace of his own to make it all the way and under the posts, giving Farnham a ten point cushion. Farnham let the kick-off bounce and had a lineout on their 25 yard line. Teo was up to his usual tricks again and poached another interception. Harvey was on hand to carry close to the line, but it was George, or G-Man to his team mates, who crossed the whitewash and open his Chobham account and half the deficit. In a high intensity game against local rivals a squabble briefly broke out, but it was settled quickly with Chobham having a scrum. Now normally the rules are that if the ball bounces it should be a ‘home’ bounce but not in these crucial minutes as Farnham extended the lead back to 10 points. Chobham now pinned Farnham back and took play to 5 yards out. It seemed as if they then managed to get over but the ref came back for a 5 yard scrum to Chob. A couple of minutes later the boys did hit back as the forwards pressed once more. Billy was held just short and Harrison finished things off. The wind was now making kicking difficult and the conversion went wide meaning Chob still needed a try to get something from the fixture. Farnham tightened their game up and kept working around the fringes running down the clock. It was Andy who won the ball back and Chob found themselves on halfway with a penalty. A quick tap and a couple of passes later Daniel was in space and behind the black and white line. He beat the covering full-back and tied things up in the corner at 22-22, with maybe a minute to play. Chob tried to chase a winning score but in desperation were penalised one final time, after much better second half discipline. Farnham again took the kick option but the wind won and the final result was the 22-22 draw, which leaves the B squad agonisingly shy of the Waterfall Cup main final on 7th April. A Squad: Rhys, Adam, Fin, Chris, Harry, Aran, Gideon, Dan, Harrison, Olly, Callum, Max, MattN, Al, Doug, Teo. B Squad: Daniel, MattW, Keaton, Saxon, Andy, Danny, Sam, Billy, Lewis, Finn, GeorgeC, Jules, Tom, Teo, Harvey, Harrison, Max.